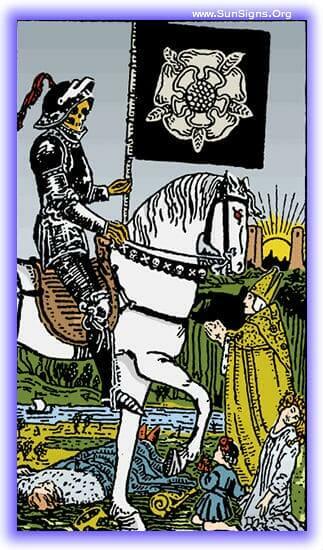 This tarot meditation on the Death card upright will focus on the benefits of change and transformation. It talks about the positive things that happen when life turns a page, and lets go of the past. As you settle in for the meditation, let yourself become open to change, to alteration and transformation. You will wake upon a hillside, in the shade of a great oak on a hot summer’s day. Around you the crops are high, soon to be ready to be harvested. Standing next to you is a shepherd, watching over the flock that also stands below. He smiles quietly to you, and offers you his hand. Standing, you take his hand, and he begins to lead you down the hill. As you walk, the day starts passing at a rapid rate, day, to night, to day, to night, like the flicking of a light-switch. You watch as the crops ripen, and the days slow down. It is now fall, and the shepherd is older, his crook has become a cane. He watches as people move through the fields down below and reap the crops that are finally ripe. The day is cold, and the bite of winter is in the air, and he leads you into an orchard. As you walk through, you can see apples left on the orchard floor, bruised and worm eaten. The days start to flicker again, rapidly moving forward, frost coats the ground, and then thaws as morning comes, and frosts over, and thaws again. Each time it thaws less and less quickly, lasting longer into the morning, until it just stays, a permanent frost. The Apples burst with rot, and decay into puddles on the orchard floor. Not long after the snow starts to fall. The day slows, and you find yourself back at the edge of the orchard. The snow has fallen, and is now thick about your legs. You can feel it’s cold biting nature, and the heavy sleep that tries to set in as the cold goes deep. In the field ahead of you, a weak ram stumbles in the snow, his bleats quiet and strained, and finally he can’t go on, and collapses. The man next to you is no longer a man, but the specter of death in his black robes and osseous countenance. His cane has become a scythe. He walks forward, and releases the spirit of the ram from its body, and collects it in in a satchel at his waist. He looks at you, and you can feel the inevitable march of change, but then the days are spinning again, and the man disappears, the winter passes, and the snow melts away. When the cycling stops, you find yourself again in the orchard, it is a cool, but pleasant, spring day. There is the sound of bleating lambs from the field, and on the ground before you can be seen the sprout of a new apple tree. Looking up, you wonder where the old man is. The cry of a newborn draws your eye, and a bough is hanging from a tree, the ruddy skinned, golden hair of a newborn swaddled in wraps of green greets your eye. It all begins again, the ever-changing wheel of time has turned. Come out of the tarot meditation of the death card, take your time contemplating the meaning of positive change, the ever turning wheel of the seasons, and how the old clears the way for the new. Perhaps there is a message here for you, write it in your journal to review later. Remember, if nothing changes, nothing changes, and the future cannot exist in stasis. How To Maintain Your Tarot Cards?